The filesize of ISP_1212P_V1401.EXE has to be exactly 9.289.605 Bytes!! If not, please download it again. 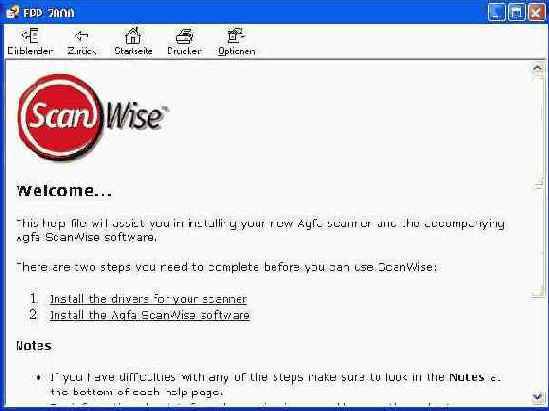 Only install the ScanWise software (Step 2). 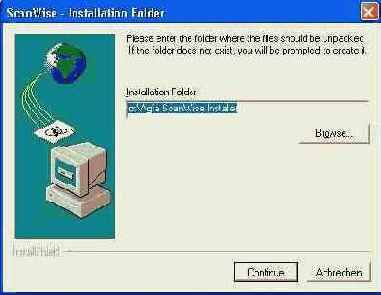 Under Windows XP the driver can not be installed with the installation program. If the setup program can not be started, you have to go in the agfa installation directory and execute there “setup.exe”. Falls sich das Installationsprogramm nicht über diesen Link starten lässt, in das Agfa-Installations-Verzeichnis wechseln, das oben ausgewählt wurde. Dort die Datei “setup.exe” aufrufen. In the directory "C:\Agfa ScanWise Installer", which has been created in chapter 1 (or other location), are the necessary canner drivers located. Start the control panel and there “Scanners and Cameras”. With the assistant add a new scanner. Selecting the driver you have to change in the directory "C:\Agfa ScanWise Installer" and select the file "EPP2000.inf". Proceed with the installation and ignore the warning.